We have our product idea (hooded baby towels and/or magnetic tiles), we know the best practices of how to find and contact suppliers on Alibaba, and now the rubber hits the road! It is time to reach out to suppliers and see if we can get our product manufactured to our specifications and at a price point that works. In today’s session, Greg shared some best practices for making outreach on Alibaba more efficient, and tips for how to organize the deluge of responses that will come once we start our outreach. We first started with a recap of some best practices for identifying the good suppliers, which we learned from Gary Huang in Session #3. Make sure to catch those notes if you missed it, lots of good content that Gary shared about finding the best suppliers possible. Greg shared some helpful tips and tricks to make the outreach to suppliers replicable at scale and easy to organize. 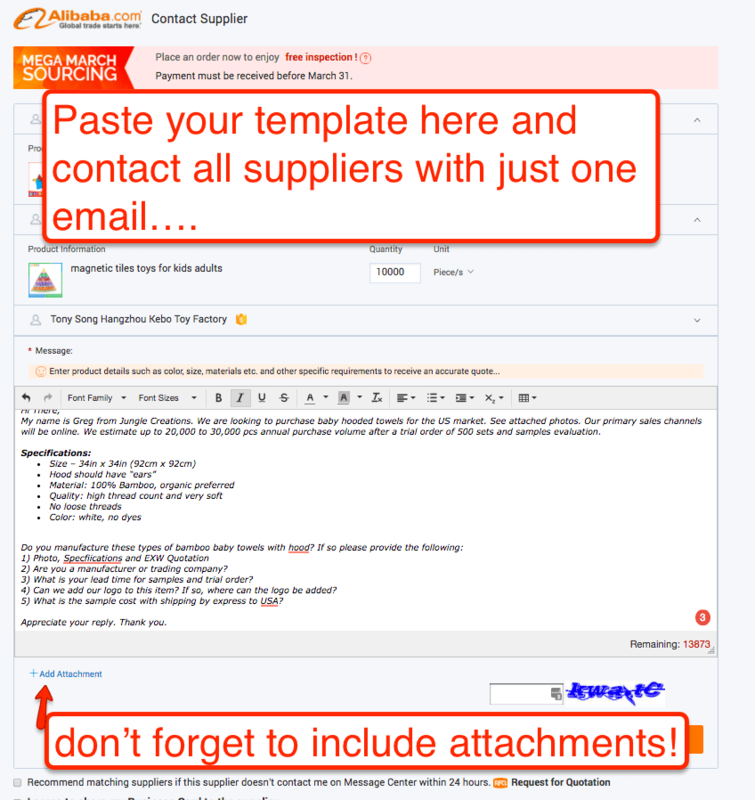 Here are some steps to leverage Alibaba’s Messaging platform to reach out to all relevant suppliers with just one email blast. There is some legwork that you have to do in order to identify who would be a good supplier. The Common Thread Test – ensure that the supplier sells only products that are within a reasonable scope of what they can actually manufacture themselves. For example, if they only produce bamboo textile products, or magnetic toys for kids, it passes the Common Thread Test. Otherwise, there is a chance that the supplier is a trading company, and another middle man may mean higher costs and harder to communicate and customize on the product. The Country Test – evaluate where a bulk of the products are exported to. There is a general assumption here that suppliers who export to North America and Western Europe have a higher quality standard to meet. 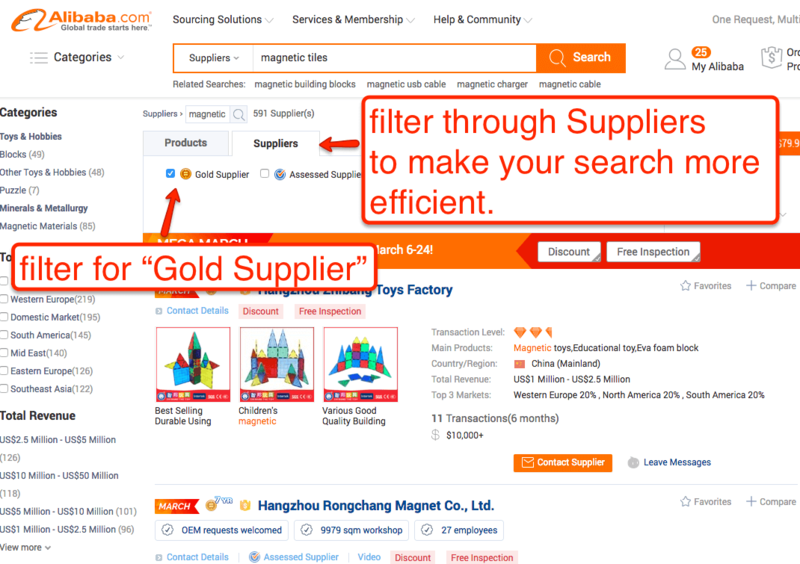 Gold Standard and Length of Time on Alibaba – the “Gold Supplier” badge can be purchased, so it is not a definitive indication that the supplier will be a good one, but it helps as a rule of thumb to go with suppliers who have a longer track record of completing transactions on Alibaba. 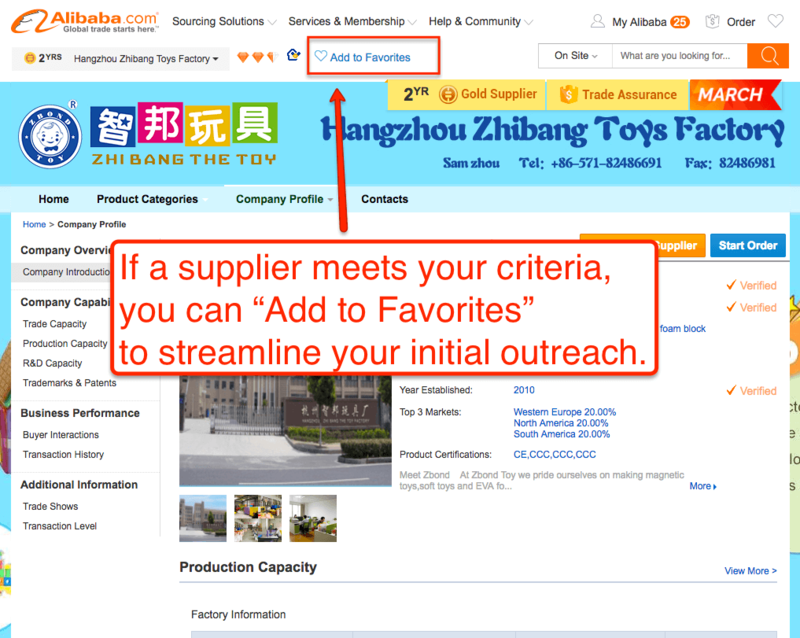 If a supplier seems worthwhile to reach out to, mark them as a “Favorite”. 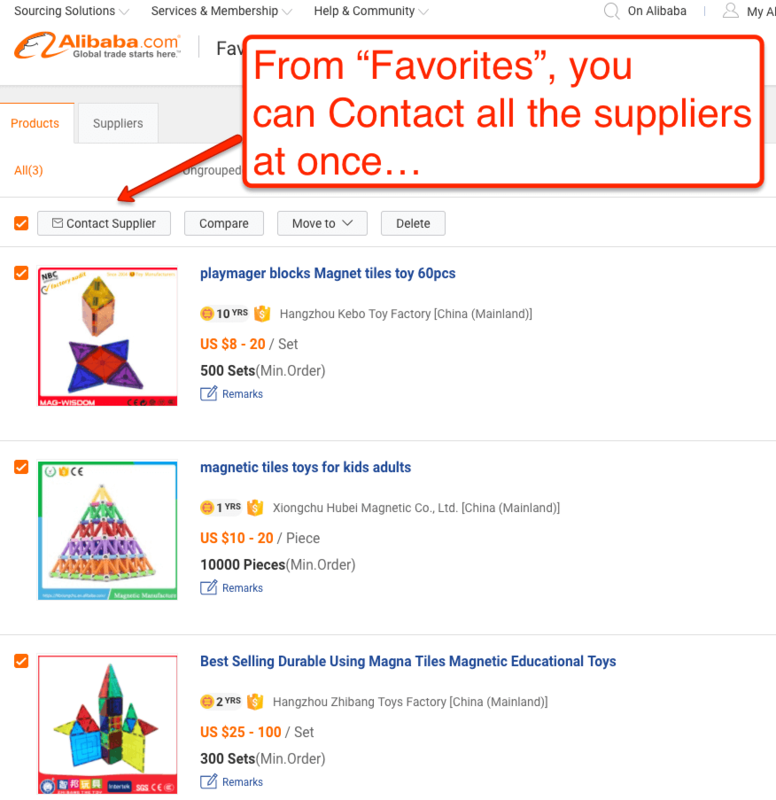 This will come into play shortly, when you can contact all of your “Favorite” suppliers in bulk. Greg shared the rationale behind his initial email template. It includes a short personal and professional introduction, a pitch on why they should care (because these towels will be best sellers, of course! ), and a list of very specific questions. My name is Greg from Jungle Creations. We are looking to purchase baby hooded towels for the US market. See attached photos. Our primary sales channels will be online. We estimate up to 20,000 to 30,000 pcs annual purchase volume after a trial order of 500 sets and samples evaluation. 5) What is the sample cost with shipping by express to USA? Of the 21 factories that he reached out to, there were 14 responses, and 3 were worthwhile to follow up with. The good responses answered all of the questions that he asked. They were timely in their response, and demonstrated solid command of English. There were photos attached, and some initiative on their part to show why they would be a good business partner for us. Thank you for your email, the professional bamboo baby products manufacturer. The 2 white hooded towel with white ear and white with brown ears you send to me are our products. we are develop some different amimal design hooded towel also. commonly we produce the hooded towel size is 75*75cm and 90*90cm as regular. we can produce as per your design and color base on MOQ 500PCS in one design per color. also we can produce as per your design such as the brown elephant design. please refer attached pricelist for you to check. we have sample for white and brown ear now, can arrange shipment immediantly. if you would like to check the elephant design, we have to produce the sample speacially, it will take about 7-10days . the bulk order production time about 30days after order confirmed. For the logo, commonly we add the logo on the wash care label. or emboridery logo on the towel, just emboridery cost is higher, it is USD0.17/PCS. The courier freight cost is USD35 for 1pcs sample. please feel free contact me for any requirement! A mediocre response showed decent English skills. There were gaps between the questions asked and their answers left something to be desired. we are towel factory ,mainly custom all kind of it with client private label according to customer requirement. 1.we had to white one . if you want to elephant design, maybe you should send me a sample or some clear detail photos. 2.we are towel factory , and we also have permission of export. 3.lead time 40days sample time 7-10days. 4.you can add your logo in anywhere of towel . hooded or others place. 5.sample cost depends on animal type. ship cost $30approx. about your requirement animal hooded towel, can you tell me more details? bamboo 92*92cm how weight do you want ? and design detail. As for the poor responses, these were canned answers that shared irrelevant information. They did not address our questions, and were clearly a template sent to everyone. This type of response shows no promise of a company that would be in a collaborative effort to produce the best baby hooded towels possible, so we just ignored them outright. We are towel factory established in 1994, and mainly customize towels with client’s private lable according to customer requirements. We have ISO 9001 cert and SEDEX audit, has customized towels for 22 years, which can ensure the delivery time well. very gald to cooperate with you large company soon, hope you can know more about our quality and service. Once a factory passed the initial test of answering questions and presenting a good case that they would meet our expectations as a supplier, Greg moved communications over to Skype. We now have three samples being sent to the States for review, which we will share on March 29th. Depending on the type of product and supplier, you can expect that it costs $35-$100 to procure a sample from a factory. Greg also discussed product customizations, pricing, and other questions in greater detail at this stage. So now we have a range of product costs too. 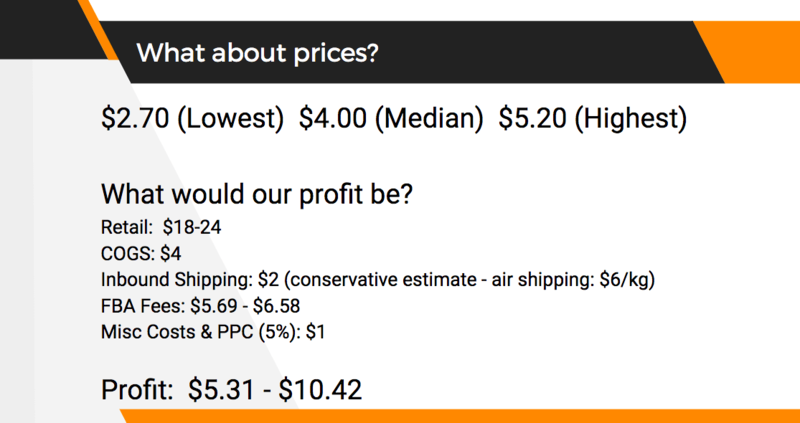 This will help inform what the overall costs would be, and ultimately what an estimate of profit per unit would be. Using these conservative estimates, the range of profits may be between $5-$10 per unit. That would certainly add up nicely as a donation to charity! Catch the next session to review the samples! We took a one week hiatus from the Million Dollar Case Study as the samples were en route from China. We reviewed them in full on the 29th March. You won’t want to miss the samples being reviewed in session #6 of the case study – find the full recap and replay here! 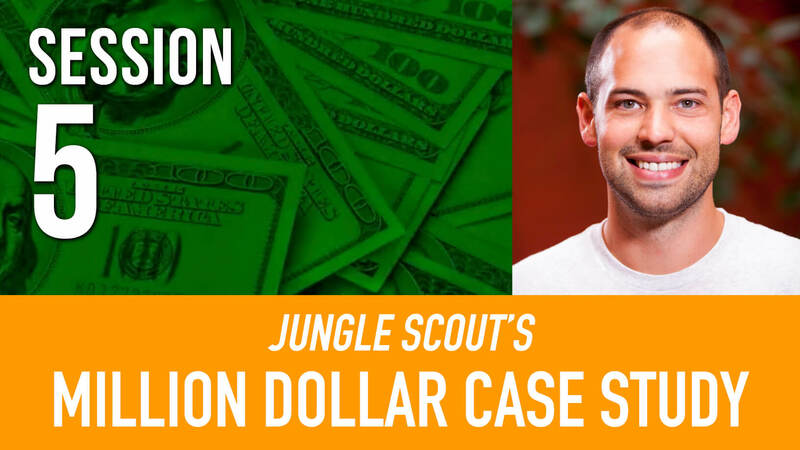 If you have not registered to join the Million Dollar Case Study yet, join us (it’s free) ? do you have an article in which you also plan in detail the planning of all costs and planned profits? I’ll ask Rolando and Greg and see what they’re coming up with! Great step by step instruction. I was not aware of the feature to send one email to multiple suppliers at one time. I followed the templete and step by step instructions just as discribed and I am already getting quotes. Thanks JungleScout Team! Generally, EXW is a product quotation excluding shipping. So that’s just the basic cost of the product. FOB is freight-on-board, which means the product’s cost including the cost to get it to the nearest port. and then DDU and DDP are costs related to the product arriving at its final location excluding tax and including tax respectively. Where is the letter to the supplier template that Greg said would be in the blog? I am not sure who was used for this shipment. We usually ask our suppliers to provide quotes for air shipments, as they generally have good connections. You can also get some quotes yourself with any courier (DHL etc.). For air shipping, I would normally just “shop around” and go with the cheapest option. 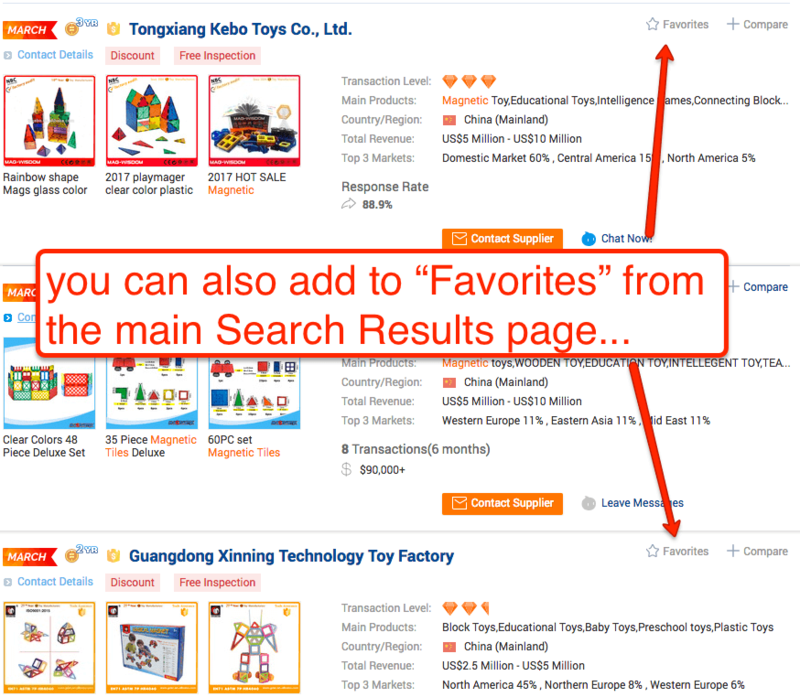 Quick question: When going through the suppliers on Alibaba, I’m noticing that I am seeing a number of them listing themselves as both a Manufacturing AND Trading company. Is this basically a trading company and I should steer clear? I saw this too. It can be confusing at times, and sometimes even when you ask a supplier outright, their answers can be unclear. Personally I steered away from those suppliers. If they are listed as both it might be that they are manufacturers of some of their common items, and operate as a trading company with others. You could try to ask directly: “Are you a manufacturer of “X PRODUCT” or do you source them from a manufacturer as a trading company?”. Greg’s advice to me was to steer away from Trading Companies, mostly because they act as a middle man and this adds to the cost. Of course you want to keep all of your costs as low as possible. But that’s not to say there aren’t good trading companies out there. We had a guest speaker in Session #4 who uses plenty of trading companies for his selling business. It wouldn’t hurt to get some quotes from a few of them and see what responses you get! in minute 31 Greg calculate 4$ production cost + 2$ shipping = saying it it would cost 6$ to bring it to amazon, leaving an average of 6$ profit which is 100% return. please explain what is the best way you calculate the future profit.. Sorry for the confusion, you have the calculations correct. His goal is 100% ROI, but that may not be possible all the time, or may just not be possible from the beginning (ie higher production costs with a lower quantity of goods, higher shipping costs if sent by air, etc). your calculations otherwise make sense. and additional things like Sales, General, Administrative you may want to account for as an overall business expense, and not on a per-unit basis. hope that hleps! Hi Emma- I’m not sure Gen’s response answers your question. The reason why they only take the $4 COGS and $2 shipping into consideration here is because that’s the investment on which you’ll have to wait for a return. The FBA fees are withheld from sales meaning that it’s a cost you, but not necessarily an investment. PPC is a bit more tricky, I don’t inlcude it in ROI calculations because I’m happy to generate sales at break even (incl. COGS, shipping, PPC costs) in order to get sales velocity and thus rank on key words. How did you estimate the inbound shipping cost? You can check Freightos.com, they have a nice tool (and additional resources) to help you estimate these costs. Very nice presentation. And very detailed also. Thank you very much for the lesson. It’s my first time in trying to get products from China. I find that the manufacturers are really set in 500 MOQ. My product is not that cheap so I want to just order 100 first to test the market but they won’t budge. Is it better to reach out to traders for this instead of going direct to manufacturers? Traders are always an option if the supplier is holding firm, but I would still recommend working directly with the OEM where possible. How many manufacturers have you reached out to? A good negotiating strategy may enable you to get what you want. For example, you could tell them that this is a trial run to ensure the quality is there, and then you will be back in 1 month with a large order and a long-term contract. If they say they can’t support you, say you will have to go with another supplier who can. You shiped samples to the US and paid for each shipment. Have you heard of this service and whether it is recommended ? In Video 5 you estimated your profit margin. I did not see any provisions for the cost of Duty? Please tell me why? Also, what minimum Quantity was your estimated profit based upon? If I ordered a quantity of say 100 my duty would not be able to make the profits and I would be upside down. Please provide a solution. I factored in the import duty into inbound shipping costs. Import duties into the states are relatively small – if that is your margin for profit or not then I think you need to keep looking and find another product. We based the cost of goods based off the factories MOQ price. Thanks! Hi guys, one thing you should also take into consideration: if the product is for babies or pregnant women, you need FDA declaration for import. Usually, cost $50 per shipment. Hello, I was wondering where you got the price quote data ($2.70, $4.00, $5.20)? It did not look like any of the responses included a price. Were they off price sheet the “good” response provided? 1. What is COGS? COST OF GROSS SALE?? 2. How to get FBA fee? How do you know the FBA fee will be 5.69 – 6.58? Greg estimates that the Cost of Good Sold will be around $4, based on the quotes from the suppliers. Thank you for all this information. You are incredibly inspiring. it would be great to record some of the conversations Greg has with the suppliers on Skype( even with just Greg face). This way we can hear the things he looks for and is concerned about as the process moves forward. He probably thinks all the stuff he asks about is obvious but to newbies it is golden info and helps build confidence that we won’t miss potential pitfalls or small but crucial details. Thanks, this is a great idea! Much of the interaction was in writing, and we will cover it this Wed 3/29 at 8p ET! Oops! I accidentally sent a message to the supplier twice. Is there any way for me to cancel the old previous inquiry? Thanks for the insight, that is very helpful! We will certainly get a more precise cost/profit calculation before investing more money. Hi! I would like to know why Greg is asking for a EXW quote verses FOB, Any advantage? Also why doesn’t he use the term of OEM for logo stuff? Shouldn’t you have mentioned the thickness wanted? that is an important detail.